The final phase to finish a 16-mile section of the Foothills Parkway and complete the "Missing Link" of the highway that has been under construction since the 1960s started in April. A highway considered the oldest unfinished highway in Tennessee is nearing completion. Work began in April to finish the final phase of a 16-mile section of the Foothills Parkway, and complete the "Missing Link" of the highway that has been under construction since the 1960s. "Today we are one step closer to completion. 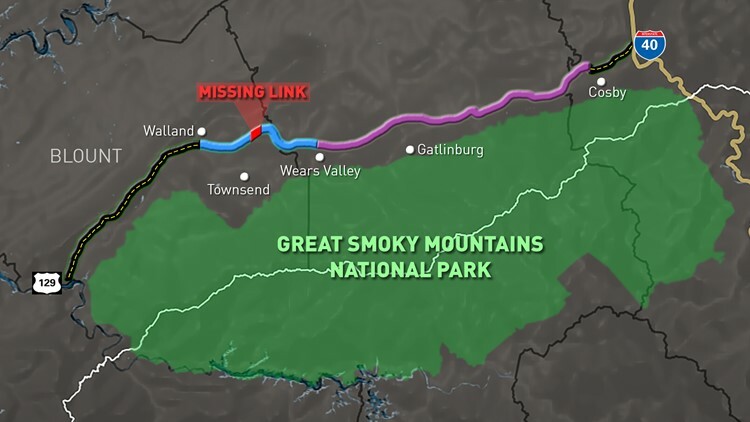 The missing link is no more," said Clay Jordan, Acting Superintendent of Great Smoky Mountains National Park. "The scenery is just part of it. It is also a story of the engineering feat that went into the construction and completion of this project." The bridges are completed but crews are still working to pave the portion of the "Missing Link." More than 250 workers have helped get the construction to the stage it is at today over the past seven years. Map of Foothills Parkway plan. Black portions were completed in late-1960s, blue is incomplete construction underway, and purple is where construction is yet to begin. The Missing Link is highlighted in red between Walland and Wears Valley. 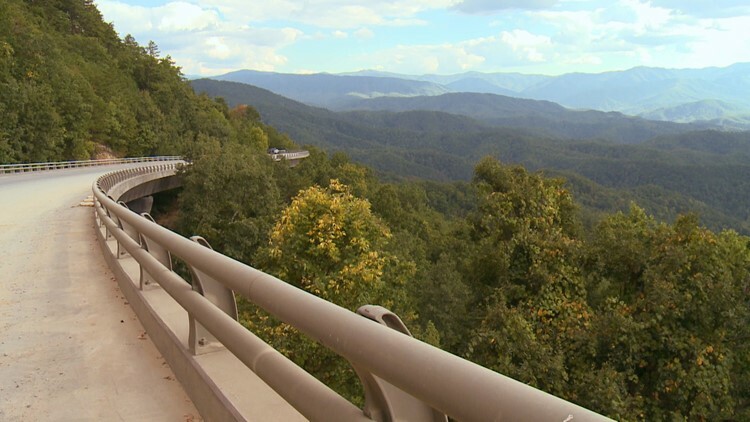 The completion of the bridges marks the first time that vehicles can travel the entire 16-mile section of the Foothills Parkway extending from Walland to Wears Valley. "Pieces of this roadway were very challenging because of the steep slopes and the natural rock material," said Dana Soehn, spokesperson for Great Smoky Mountains National Park. "The Solution to be able to bridge this challenging 1.65 miles of challenging terrain was a series of bridges so that we could lay very lightly on the land." The seven-year construction process to build five bridges cost $48.5 million. The "Missing Link" was a mile-and-a-half gap in the road. Bridge 2 along the Missing Link on the Foothills Parkway. Congress approved plans for the 72-mile scenic route in the 1940s. Construction started in sections in the '60s, but only 22.5 miles of the road were complete until recently. "The foothills parkway was authorized by congress in 1944 as a scenic drive that would provide our visitors an opportunity to view the western flanks of the Great Smoky Mountains National Park," said Alan Sumeriski of Great Smoky Mountains National Park. "From 1970 to today we've had a number of starts and stops due to infrastructure failures and financial constraints."